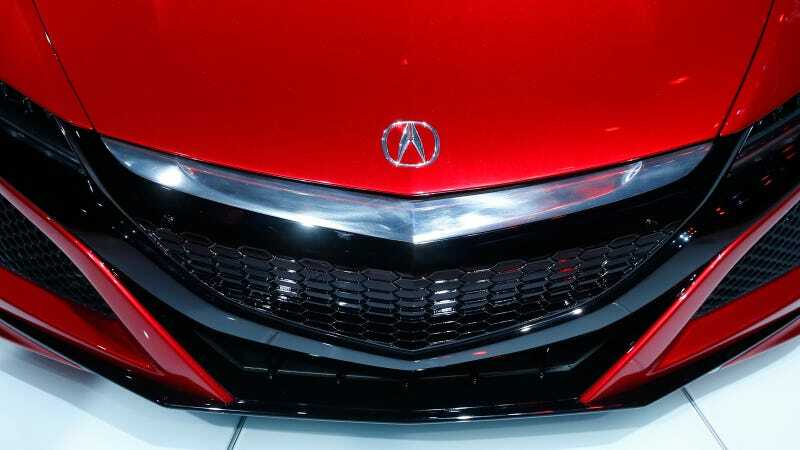 The gestation period of the 2016 Acura NSX feels like it has taken forever, but in reality this car has taken just three years to go from concept to production car. That's incredibly fast. Especially considering that the entire powertrain concept changed less than two years ago. In a conversation with Ted Klaus, the chief engineer of the new NSX, we were told that the layout of the NSX changed from transverse to longitudinal. The switch in layout was made to increase flexibility in the powertrain as well as for packaging reasons. This made for a number of changes. Since the last concept, the NSX has grown by three inches in length and an inch in width. It's gone from a naturally aspirated off the shelf engine to a clean sheet design twin turbocharged V6 with a 75 degree v-angle. Right now, this engine will only be in the NSX and the entire hybrid system will make at least 550 horsepower. At least. That's double the power of the old NSX. Double. The changes allowed for better packaging of the hybrid system. It also let them have the ability to upgrade the system in the future since it isn't as tight. Yes, some of the weight of the transmission now shifts behind the rear axle, which does create some issues for weight transfer and packaging, but the team thought that the tradeoff would be worth it. As for driving it, Klaus says that the driving experience is analog. Yes, a hybrid with three electric motors and a nine-speed dual clutch "feels analog." Obviously, I can't judge because I haven't driven it, but if they accomplished that, it's great. The NSX also uses its hybrid system for torque fill, like the McLaren P1. They say it has constant thrust, like a Tesla that doesn't top out. The engine and electric motors work together to keep torque constant, they call it an instant launch. We were told that the batteries stay in a constant state of charge so that they don't drain and compromise performance on the track. Oh, and it can carry a golf bag and a couple overnight bags. Though if you plan on doing that perhaps you should buy one of Acura's more golf-y products. We'll be driving the NSX later this year. We'll see if it lives up to the promise. I'm cautiously excited.